Port A Pizzeria offers an all-day buffet serving pizza, pasta, and salad. We also offer gluten-free dishes. Whether you dine-in, carry out, or get it delivered, you'll love our 'za! "Seven days without our pizza makes one weak." "A sign of flavorful things to come." "Life has enough mystery as it is -- why add our delicious food to the list? This pizza is not to be missed!" "We'll eat all the vegetables you want -- as long as they're on a Port A pizza!" "An empty stomach deserves a full plate of flavor." Yes, I'd like to receive news from Port A Pizzeria. 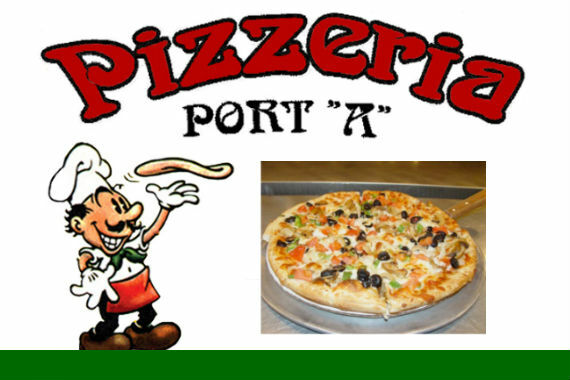 Sign up for the Port A Pizzeria Newsletter!